Asus had a third Android tablet at their booth - the Memo Pad Smart ME301T. It's a 10.1" tablet with Tegra 3 that aims at a lower price point than most other 10.1" tablets out there. 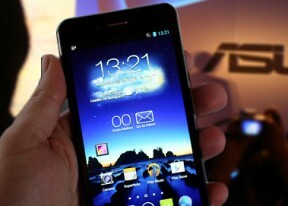 Asus unveiled it in Thailand with a $360 price tag, international pricing wasn't announced. The IPS LCD screen has WXGA resolution for 150ppi pixel density. That's only half the pixels per inch that the Google Nexus 10 tablet offers and that is $400 (if you live in the US). It's not as good as the Padfone Infinity Station screen either, but that's a much more expensive device. The Nexus 10 is the exception, most affordable 10.1" tablets have WXGA screens. While the plastic on the back of the tablet isn't the best, the Memo Pad Smart is 9.9mm thick and weighs 580g so it still feels pretty good in the hand. There is a 5MP main camera and stereo speakers on the back with the proprietary SonicMaster tech to improve the sound. The Tegra 3 chipset has four CPU cores clocked at 1.2GHz and there's 16GB of built-in storage, expandable via microSD cards. You also get 5GB life-time Asus CloudStorage. The Asus Transformer AiO is one of the oddest devices we've seen to date. It's an all-in-one Windows 8 computer with an Intel Core i5 or i7 processor and an NVIDIA GT 730M powering it. The screen is an 18.4" IPS LCD with 1080p resolution and 10-point multi-touch. The display itself is detachable from its stand and can be used as a huge tablet. The Intel CPU and Windows 8 OS live in the base, however, so in tablet mode you get Android 4.1 Jelly Bean running on Tegra 3 that's packed inside the tablet. It is possible to use Windows 8 with the tablet detached, but it will run on the base station and stream the display image to the tablet wirelessly over Wi-Fi. You can also use Android when the tablet is docked if you prefer. The screen has good image quality and is a very good computer monitor. For a tablet screen it's not all that great though. The side of the AiO feature a button to switch between Android and Windows, a miniUSB port, a microSD card slot, a 3.5mm audio jack and a laptop-like charger port. The desktop base station has more connections, including full-size USB 3.0 ports and an SD card slot, plus an optical drive. On the other side of the tablet there's a Kensington Security slot. There are stereo speakers on the back of the tablet, along with the flaps used to attach the tablet to the base station. The Transformer AiO is not a tablet you can use on the go - it's big and rather heavy (for a tablet) too. It weighs 2.5kg, which is 15" laptop territory. For a 18.4" screen it's not so bad though. The battery life clocks in at 5 hours. Again, not what you want for use on the go, but for use at home it's perfectly adequate. The Asus Transformer AiO is similar to the Sony Vaio Tap 20 and that 20" Panasonic tablet, but with the added bonus of Android support. It's certainly an unusual device but we found the hardware quite pleasant and we can see using an 18.4" tablet (running Windows 8 or Android) on the sofa at home, then putting it on its base next to the keyboard and mouse when serious work needs to be done.